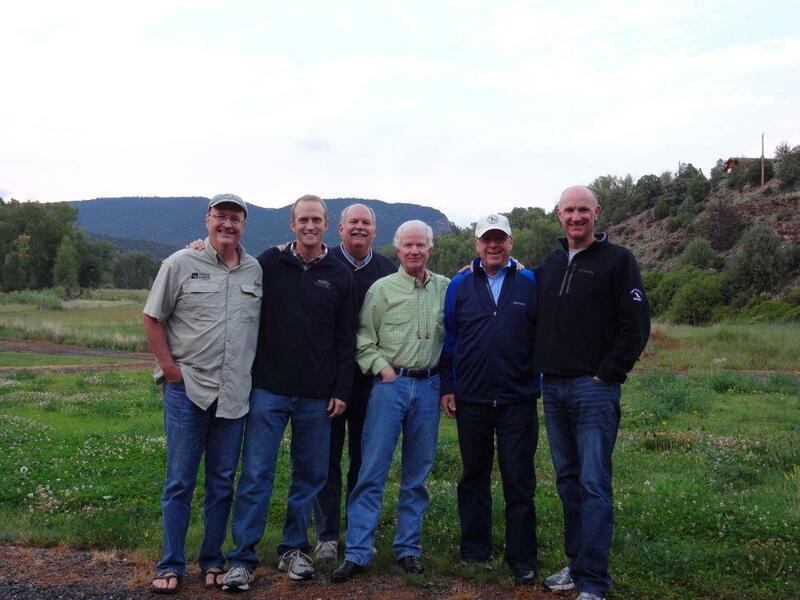 Tiger, Peter, David, Rusty, Terry, and me — enjoying Colorado, God’s beauty, and of course, fishing! I just got done working out… can’t decide if I like working out, or if I don’t. Nevertheless, I listened to an Andy Stanley podcast. I like to do something while I am sweating, and even though I don’t know Andy, I like his style! I am stealing two words I heard today that had nothing to do with the over-arching podcast — Invest and Invite. What a great concept. I think he was talking about getting people to church. Invest in them. Later, after you have invested you can invite. I would love to take another angle on this. I will use the same two words though, and tell a story! Invest. The people above are people that have been invested into. Relationships, time, communication, thank-you’s, dinners, golf games, conversations, travel, and a whole lot of laughs. Who are the people that you are investing in? You are investing into these people for so many reasons. I have to say that my calendar showed the trip above as a “work” trip. The investment was (a) saying yes to going, (b) going, (c) cooking breakfast, (d) fishing, (e) going golfing one afternoon, (f) riding four-wheelers, (g) eating great dinners, (h) having a bible study/devotional with conversation and questions, (i) going on runs, and many things I have not even put down. Who are you investing in? You are pouring into them and even at times “their things.” You remember to drop them a note, follow up on something they have said, have a meal, send them a book, make a note of what they are currently focused on in their lives. Invite. In the development world the one reason people are fearful of it, and some even say, they wouldn’t want to do it is the fact that they think about the dreaded — ASK. What seems to be way less threatening is – INVITING. It could be inviting to lunch, inviting to an event, inviting to your home, inviting to some form of an adventure — you pick! As I look back, in this case, as the picture attached here, there has been a lot of invites, and way less “asks.” I would even make a case that these men come to a gathering because of the invite to depth in relationships, inviting to give some insights to life issues, and finally, an invite to talk real life topics. Who are you inviting? You are not asking them to join your thing, to give to your priorities, but rather a softer word and welcoming word — invite! Simply put — invest and invite to the people around your life… people know when they have been “taken from,” and “asked.” What people want is to be invested in and invited. You can give this some thought. I shared your “Pithy Phrases to Live By” with a bunch of friends. As we discussed them I got “Push back” on “God gave you a gut – follow it” The probably needs to be a distinction between the flesh gut (that will lead you into trouble) and the one you’re talking about! Food for thought.